The Hautes-Alpes, 1943. Young Sebastian and his adoptive grandfather Cesar live in a village occupied by the Nazis. 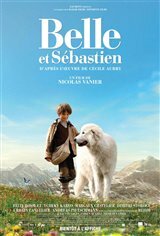 When a mysterious beast starts killing sheep, Sebastian and Cesar track a big stray Pyrenean sheep dog, whom the villagers think is the killer. When Sebastian spots it, he realizes the dog isn’t the beast and he makes friends with her, naming her Belle. However, the villagers continue to believe she’s the monster they’re searching for, so he hides her in a cave.